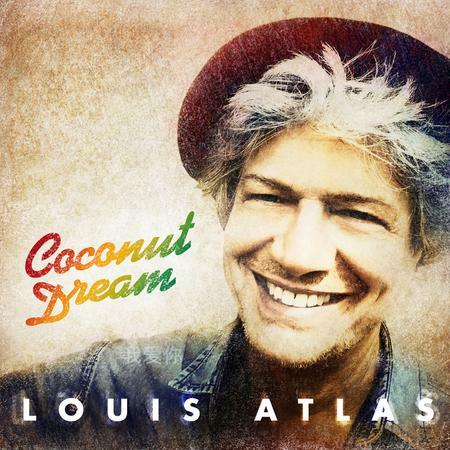 New York reggae artist Louis Atlas will drop his fourth album March 15. Comprising 10-tracks of scrumptious reggae concoctions, the songs on Coconut Dream are about love. Originally from Rochester, NY, Atlas grew up with music in his soul and singing in his blood. Later, he began playing in rock bands, and then attended the Boston Conservatory. From there he went to New York, where he landed the role of Teen Angle in the national tour of Grease. He was hooked for life. Since then, he’s released three stellar albums: Beat of the Heart, Citizen of NYC, and Arms of Heaven. The new album, Coconut Dream, features a who’s who of talent, including Andy Bassford (guitar), Bryonha Parham (vocals), and Christian Cassan (producer, drummer). Two tracks from the album, “The Lunatics” and “The People Must Be Free” are presently available for preview. “The Lunatics” opens on a roots reggae groove featuring tight skiffing guitars and a one-drop beat. Parham’s delicious background vocals fill the tune with iridescent ebullience as Atlas’ velvety, rich tones imbue the lyrics with contagious tones. “The People Must Be Free” rides radiant pulses of color atop a skintight rhythm of taut percussion and a throbbing bass line. A deep leitmotif resounds in the backdrop, adding dark, potent energy as the glow of the organ oozes with creamy assurance. Atlas’ voice takes on a penetrating resonance, nuanced with fervent textures. Both tracks are excellent, full of infectious supple melodies, buff rhythms, and the evocative tones of Louis Atlas.